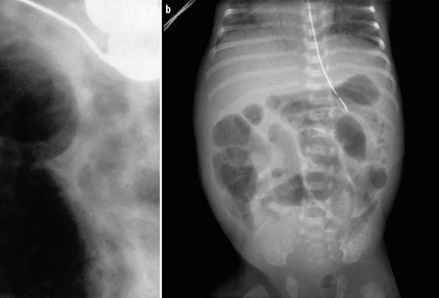 The most characteristic features of Crohn's disease of the small intestine are the variety of its radiological appearances and the multiplicity of radiological features often present in the majority of patients. Categorization of these radiological features has been defined in terms of stenotic and non-stenotic forms, active and chronic, early and late or advanced, or into superficial, transmural and extramural changes. Most information on the sequence of progression of the pathological lesions in Crohn's disease is derived from radiological descriptions. The early lesions of Crohn's disease are: blunting, flattening, thickening, distortion and straightening of the valvulae conniventes. These changes are followed by discrete ulcers and by longitudinal and transverse ulcers. The stenotic phase eventually develops and the involved segment is transformed into a rigid, castlike tube; fistulae may be seen at this stage. Deep ulcers precede sinuses and fistulae to other organs. Discrete ulcers are seen as small collections of barium with surrounding radiolucent margins. Fissure ulcers are seen in profile and may penetrate deep into the thickened intestinal wall; small abscess cavities are occasionally seen at the base of deep fissure ulcers. Longitudinal ulcers running along the mesenteric border of the ileum are a characteristic feature of Crohn's disease, although they are only occasionally present. Cobblestoning is caused mostly by a combination of longitudinal and traverse ulceration. Discontinuous involvement of the intestinal wall shows either as skip lesions or asymmetry. 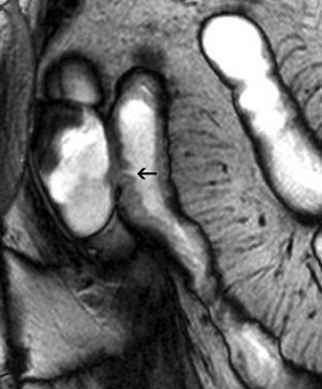 Asymmetrical involvement of the intestinal wall produces the characteristic 'pseudodiverticulae' appearance. The pseudodiver-ticulae represent small patches of normal intestine in an otherwise severely involved segment. The involved segment contracts and the normal areas become pseudodi-verticula. Inflammatory polyps (pseudopolyps) are occasionally seen in Crohn's disease and are seen as small discrete filling defects in a severely involved segment. 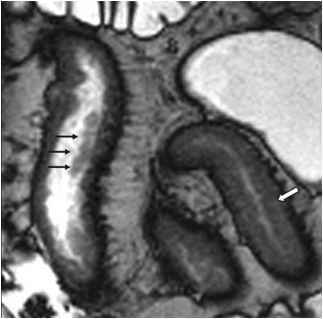 Cross-sectional imaging modalities offer an important complementary diagnostic perspective in patients with Crohn's disease, due to their ability to directly image the intestinal wall and surrounding mesentery and therefore to determine the extramucosal extent and spread of the disease process. CT is being performed with increasing frequency and has been shown to be extremely valuable in documenting mesenteric disease, including fibrofatty proliferation, abscess or phlegmon formation, microadenopathy and in adequately evaluating perirectal and/or perianal extension of Crohn's disease. It has also been suggested that CT is the most sensitive means of demonstrating an enterovesi-cal fistula. In addition, the ability of CT to simultaneously evaluate extraintestinal organs may allow the detection of concurrent hepatobilliary, urinary or muscu-loskeletal complications, that may well lead to significant changes in the management of the individual patient. ment (Fig. 4), while increased mesenteric vascularity is easily depicted on true FISP and 3D FLASH images. The clinical utility of MRE in Crohn's disease has not been widely established. At present, the method may be suggested as a complementary diagnostic tool with advancing perspectives.